Gum disease is an infection, and the first sign of it is reddened or swollen gums. After a while, the gums become so sensitive that simply brushing your teeth can cause them to bleed. When there are food particles between your teeth, no amount of mouthwash or breath mints will take away the odor permanently. Those particles have to be eliminated to completely get rid of bad breath. When an infection spreads below the gum line, the roots of your teeth become affected. This can lead to pain, and there is no pain like toothache pain. Teeth that are damaged by disease start to loosen. Trying to eat with loose teeth can be difficult and painful. Loose teeth can make it difficult or impossible to eat some of your favorite foods. Teeth can start to blacken from decay, which can ruin your smile and cause embarrassment. Decayed teeth also make bad breath worse. The final result of untreated gum disease is tooth loss. Even one lost tooth can cause problems because it undermines the underlying foundation of your teeth. Other teeth can start to shift out of place when one tooth is missing. One of the best oral health tips in the world is to brush and floss daily and to see the dentist for regular checkups. Doing these three things can prevent you from ever needing complicated dental work. Skipping the flossing is tempting, but if you do, you are likely to wind up with problems that will require involved dental treatments. Severe gum disease requires treatment that goes to the roots of the teeth, and in some cases it may require surgery or root canal. 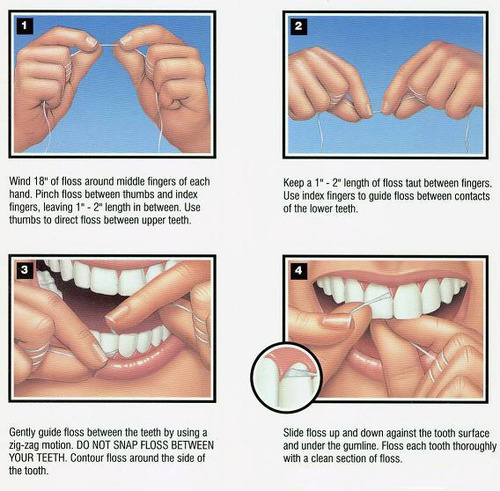 Flossing your teeth is as important as brushing. You should brush at least twice a day, and floss at least once daily. If you are looking for a dentist in Monroe who can talk to you about at-home oral hygiene, give you oral health tips and answer all your questions about your teeth and your oral health, give our office a call. Our dentist in Monroe is at a great, central location, and we can set up an appointment for you at your convenience.